The Balsamic Glaze is my new favorite product at Trader Joe’s. It’s both sweet and vinegary, and adds great flavor to salads, meats, and fruits. I have yet to try balsamic glaze on ice-cream, but apparently it is quite tasty. After a busy week with school starting at KIPP and Brent adjusting to his new job at Focusrite, we decided to spend Friday night at home. I prepared grilled chicken and made this salad with our farm box ingredients. The salad was so simple to build, highlighted the fresh produce, and looked so elegant. 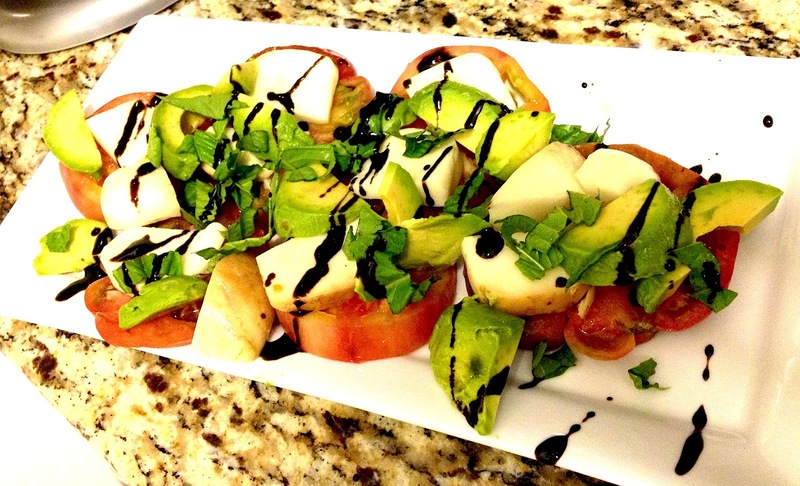 To prepare the salad, slice a few fresh heirloom tomatoes, the top them with smoked mozzarella and avocado. Next, sprinkle the salad with julienned basil leave, drizzle white truffle oil and balsamic glaze and last add a pinch of salt and pepper.